Archive your digital photos on a long-lasting CD that's playable on standard DVD/VCD players. ?/b>Professional user interface and very easy to use. ?/b>Powerful photo editor integrated makes it easy to edit your photos. ·Choose from hundreds of transition effects for your slideshow. ?/b>Choose background music (MP3) for your album. ?/b>And multiple music files for a single slide show is supported. ·Easily control for individual photos. ·You can now add text, photo date, file name on your photo. And easily to change the font of the text. ?/b>Easily to organize your photos into multiple albums.
? 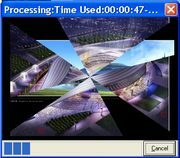 Real-time monitor the process of converting photos and audio to mpeg files. ?No quibble 30-day money-back guarantee. New: new transition effect, process of the first frame of mpeg file. 1) Registration code of previous version can NOT work with this version again. Please contact [email protected] and supply us with your purchase information, we will generate new registration code for you as request.